It would be interesting to have a full blood test done and compare it to before. I have never had high cholesterol in general but my LDL/HDL ratio was slightly off and my triglycerides were always high. Be that as it may the important thing is I feel healthy. Oh I still do fast food from time to time despite my best efforts to get away from it, sometimes I'm just too lazy/tired in the morning to want to make lunch. But the majority of my cooking is my own, no prepared frozen meals, no instant dinners in a box, heck I've even done away with buying bread and bake my own. When I first started this blog I was quick to embrace Organic produce as being a representation of what they had to work with in the Vintage Era however this is not totally true and my views have changed recently. Chemicals used in produce farming started becoming predominant in the 30's. Mainly chemical fertilizers at first but after many different bug infestations you had the beginnings of pesticides like DDT. Don't get me wrong, chemical anything is bad for you but what they use now is not nearly as much of a health endangerment as what they used then. I think the real turning point happened in the late 40's after WWII and that's when we had the use of chemicals in farming on a massive scale. So where does that leave us now? I have come around to the belief that how your food is grown matters less than where it's grown. Local Produce is the way to go because much of it is organically grown by small farms that can't afford the huge fee for organic certification. Also with locally grown it's riper, more tasty and good for the local economy. Stores like The Fresh Market are realizing this and getting involved with stocking local and regional produce. So my new rule is "If it comes from a foreign country (especially Mexico) pass it by." The other reason I am disinclined to follow the Organic bandwagon as much as before is because the marketeers have embraced the Organic craze. Too much of what is out there is commercialized organic, organic in name but utilizing questionable ingredients and processes. 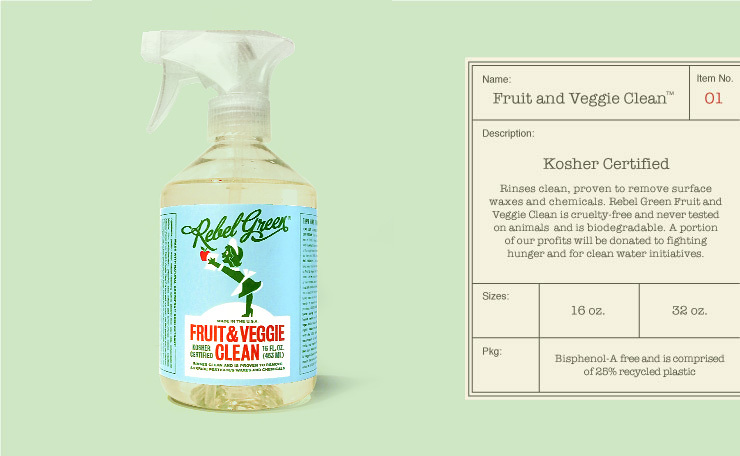 In closing, get yourself a bottle of Rebel Green Fruit and Veggie Wash which reduces or eliminates surface chemicals, dirt, oils and even removes that nasty "food grade" wax they put on certain produce like cucumbers.